Almost everyone swears, or worries about not swearing, from the two year-old who has just discovered the power of potty mouth to the grandma who wonders why every other word she hears is obscene. Whether they express anger or exhilaration, are meant to insult or to commend, swear words perform a crucial role in language. But swearing is also a uniquely well-suited lens through which to look at history, offering a fascinating record of what people care about on the deepest levels of a culture-what's divine, what's terrifying, and what's taboo. Holy Sh*t tells the story of two kinds of swearing-obscenities and oaths-from ancient Rome and the Bible to today. 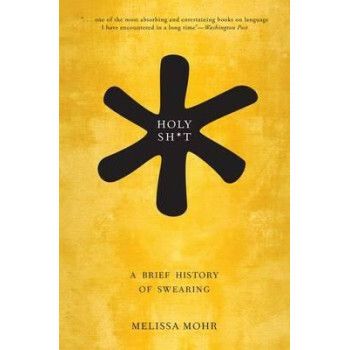 With humor and insight, Melissa Mohr takes readers on a journey to discover how "swearing" has come to include both testifying with your hand on the Bible and calling someone a *#$&! * when they cut you off on the highway. She explores obscenities in ancient Rome-which were remarkably similar to our own-and unearths the history of religious oaths in the Middle Ages, when swearing (or not swearing) an oath was often a matter of life and death. Holy Sh*t also explains the advancement of civility and corresponding censorship of language in the 18th century, considers the rise of racial slurs after World War II, examines the physiological effects of swearing (increased heart rate and greater pain tolerance), and answers a question that preoccupies the FCC, the US Senate, and anyone who has recently overheard little kids at a playground: are we swearing more now than people did in the past? A gem of lexicography and cultural history, Holy Sh*t is a serious exploration of obscenity-and it also just might expand your repertoire of words to choose from the next time you shut your finger in the car door.